Invited in 1933 by the orientalist Miguel Asín Palacios to lecture in Madrid, the preeminent Persian and Urdu poet Muḥammad Iqbāl availed himself of this opportunity to make a sojourn south to visit the Great Mosque of Cordoba. He became the first Muslim to offer prayers in the mosque since its conversion into a cathedral after the consolidation of the Christian Reconquista following the fall of Granada in 1492. By all accounts, the stirring intensity of this experience was nothing less than theatrical. Iqbāl, radically moved by the visual sumptuousness of the mosque, which he equated with an all-embracing majestic aura of Islam, and under a spell of fervent emotions coursing through him as a consequence of this encounter, apparently swooned upon entering it (Noorani 1999, 237). The eager inflections of this experience summarily gained posterity in the thematic formulations of his celebrated Urdu poem ‘Masjid-e Qurt̤uba’. In this regard, it is nearly redundant to indicate that Iqbāl’s response to the visual splendor of the mosque can be better appreciated in an emblematic way, as an invocation of his formulated concept of Islam’s earlier glory, and a crucial need for this glory’s renaissance in the conduct of the contemporary Islamic Umma. Evidently, Iqbāl’s concerns lie far from the historical exactitude, as well as the historical compositeness, through which the architectural refinements of the Cordoba mosque may be engaged. ʿAmīq Ḥanafī makes an astute observation in his article on ‘Masjid-e Qurt̤uba’ when he says: ‘The poem under consideration is not shackled to its designation or beholden to its subject; rather, it exploits the experience of the visit to the mosque as raw material for a self-replicating creative act’ (1977, 33). Arguably then, Iqbāl’s lyrical enterprise is singular in the sense that it eschews the reckoning of this monument on the express merit of its visual constitution. And with this realization in mind, it would be worthwhile to explore the potential correspondences between his imaginings of a pan-Islamic vitality in the material elements of this monument with the architectural vicissitudes of the very same monument rooted compellingly in Andalusian historical formations. It may be prob- able that tracking the visual evolution of the Cordoba mosque will reveal an alternate paradigm, at variance with the one envisioned by Iqbāl where the incidence of this mosque is primarily an expression of the sweeping exertions of the mard-e khudā. But it is just such alternate readings of the Cordoba mosque that can endow us with the requisite agency to foreground the divergent ways in which its historical connotations may be appropriated. The quality of Quvvatu’l-Islām [mosque] is not discernable in it. As with later buildings, an infirmity has crept into the element of its vigor, and in fact, it is this very element of vigor which institutes a balance for beauty. I kept straying here and there in the halls and porticos of the Alhambra, but wherever I raised my eyes, I saw huā ghālib [He is victorious] inscribed on the walls. I said to myself that everywhere here, it is solely the Almighty whose triumph is proclaimed; if only the triumph of Man too was visible here, then it would be something. Clearly then, Iqbāl’s responses to Islamic architecture draw their insights from an ideological space upholding masculine vigor and majestic bearing envisioned as prime constituents of Islamic cultural rejuvenation. They advocate verve, reflecting the selfhood of their executors; ultimately, it is the presence of the palpable exertions of the mard-e khudā in an architectural edifice that bestow upon it an enduring worth. at whose hands Damascus has become a wasteland. Of course, Iqbāl’s polemic here is directed at the early twentieth- century French policies in Syria, which have debased the superlative integrity of Damascus—the urban locus representing an Islamic mode of existence—and turned it into a wasteland. With such happenings to reckon with, the creation of these miracle-peddling firañgīs, even if it were a mosque, cannot be worthy of appreciation for it harbors the sullied aura of its exploitive creators. Europe shall not withstand the radiance of my songs. The lyrical progression of ‘Masjid-e Qurt̤uba,’ therefore, does nothing less than lead to the vision of a new world, to the efflorescence of an unbound, de-territorialized umma, the domain of the mard-e khudā. It is embedded in a much more ubiquitous temporality than is granted to the mosque by the topical considerations of its historical and visual development. Dynamic love, infinite all over, which is beyond past and present. The more historically rooted impulses, and the potential local imperatives, which might have influenced the visual language and form of the Cordoba mosque, are outside the sphere of Iqbāl’s concerns here. Rather than tethering it to a historical specificity, the surge ofʿishq that shapes the visual majesty of the mosque, serves to de-territorialize the structure. The mosque relinquishes its locative specificity to embody a limitless pan- Islamic terrain in the proclamation: ‘is kī zamīñ bē-ḥudūd, is kā ufaq be- ṡughūr’ (its terrain unending, its horizon boundless) (ibid., 388). In ‘Masjid-e Qurt̤uba’ thus, the mosque’s visual splendor is a conduit for the vision of a new world; it is an instrument for translating the mard-e khudā’s creative conduct into a language of splendorous visual forms. In the wake of the above imaginings of the Cordoba mosque, the realization that this sanctuary, in its comprehensive formation, is a final product of at least four to five major extensions inspires some curiosity.2 The first two phases of the mosque’s construction, respectively under ʿAbd al-Raḥmān I in 786 and ʿAbd-al Raḥmān II ca. 836, reveal a seamless visual continuity. Here, the articulation of the plan is predicated on an established tradition of Islamic sacred structures based on a hypostyle arrangement with a series of bays and aisles structured by a procession of columns at recurring intervals. This schematic description, however, does not succeed in communicating the astounding ingenuity of the mosque’s interior space, which, in the art-historian Jerrilynn Dodd’s words, ‘explodes into a labyrinthine elevation of superimposed horseshoe shaped arches composed of voussoirs in which deep red brick and white stone alternate’ (1992, 12) (see, fig. 1). It is the frenzied symphony of these two-tiered arches that spells an original language of architectural forms for the mosque, quite distinct from the mosque’s counterparts elsewhere in the Islamic world. In this regard, the horseshoe arch, an element indigenous to Visigothic church- building traditions of pre-Islamic Spain, heralds the assimilation of a discernibly local constituent into the mosque’s vocabulary, while the practice of superimposing one arch over the other has an even earlier precedent in the Roman hydraulic structures in the region, most notably in the aqueduct at Mérida which combines superimposed arches with alternating brick and stone masonry. 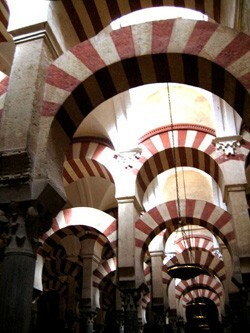 In this sense, it is in the adaptation of indigenous architectural elements that the Cordoba mosque brings into its orbit the cultural moorings of a heterogeneous Cordoban citizenry, an admixture of Arabs, Berbers, and a small group of fresh converts from Christianity to Islam, among others, who comprised the elements of the populace in the burgeoning Hispano-Umayyad emirate on the Iberian soil. Thus, at a prime level, a cultural memory tinged with an indigenous hue is preserved in the mosque’s visual expression. Also, in reference to his Umayyad lineage, ʿAbd al-Raḥmān I’s nostalgic yearning for his Syrian homeland, which he had been forced to flee in the wake of the ʿAbbasid onslaught, has been amply chronicled, most famously in his verses addressed to a lone palm tree on his estate of al- Ruṣāfa. Accordingly, scholars have postulated an evocation of ʿAbd al- Raḥmān’s cultural associations and memories in the visual forms that he reflexively privileged in the mosque as its commanding patron. 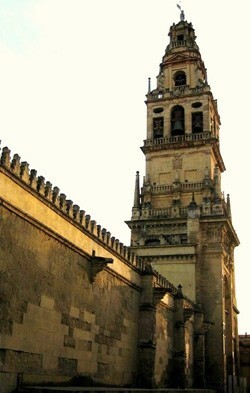 In this light, the mosque of Cordoba may be read as fusing a Syrian Umayyad language of forms, especially in invoking the Great Mosque of Damascus for its spatial inspiration, with an architectural vocabulary drawn from preexisting indigenous building traditions.4 The visuality of the mosque therefore emerges as a function of impulses grounded in its founder’s dynastic evocations and aspirations, at a discrete variance with the grand creative rush of ʿishq in the endeavors of the mard-e khudā, as envisioned by Iqbāl. The next significant addition to the Cordoba mosque, undertaken by ʿAbd al-Raḥmān III ca. 951, brings a more dramatic set of aspirations into its sphere. The meanings that accrue to the visual lexicon of this sovereign’s enlargements, notably preserved in the refurbished courtyard to the north where he introduced arcaded porticos on its three sides, but more expressly, in his incorporation of a square-based minaret on the northern edge of the mosque alongside the central entrance, underscore the stately ambitions associated with his assumption of the title of caliph. While transforming the morphological constitution of the Cordoba mosque, the imposing minaret also emerges as a visual device meant to enhance the image of ʿAbd al-Raḥmān III’s Andalusian caliphate. As Jonathan Bloom suggests, it stands as a physical manifestation of the new Andalusian caliph’s defiant stance, especially against the coexisting Fatimid contentions to similar caliphal legitimacy within Islamdom (cited in Dodds 1989, 17).5 The symbolic charge of ʿAbd al-Raḥmān III’s extensions to the Cordoba mosque is thus historically positioned to reflect the restoration of his Umayyad caliphal authority; rather than harboring a timeless spirit in the act of creation, it rests on pressing political exigencies. In this light, Iqbāl’s exultation: ‘tērā mīnār-e buland, jalva gāh-e jibraʾīl’ (your soaring minaret, Gabriel’s spectacular abode) (1989, 388) can only be ascribed to his musings centered on a vision of an Islamic reawakening, for the poet’s actual encounter with the minaret could only have been in its incarnation as a church tower crowned with a belfry, following its metamorphosis in the sixteenth century under the Christian hegemony (see, fig. 2). It is with the elaborate extensions commenced in 962 under ʿAbd al- Rahmān III’s son and successor, al-Ḥakam II, however, that the Cordoba mosque begins to consolidate an aura of caliphal dignity. The further augmentation of existing aisles of the prayer-hall in the direction of the qibla now culminates in a lavish new maqṣūra surmounted by ornate ribbed cupolas in front of a richly ornamented mihrab. This serves to radically rework the spatial as well as visual configurations of the mosque. While al-Ḥakam II’s extension of the aisles, in its replication of the two-tiered horseshoe arches surmounted on columns, retains the visual schema privileged by his predecessors, the bays demarcating the maqṣūra herald a visible departure from that scheme in their employment of densely inter- laced polylobed arches. Even more eloquent is the qibla wall with the mihrab, accentuated with exquisite mosaics patterned in luminous formations of abstract, geometrical, vegetal and calligraphic motifs (see, fig. 3). Yet again, the meanings encoded in these new visual formations of the Cordoba mosque stem from the composite historical imperatives of the time. 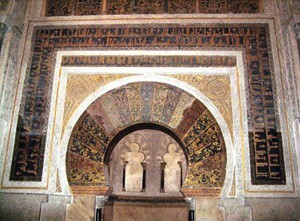 Al-Ḥakam II’s reign had witnessed record conversions of indigenous Christians to Islam, and while on the one hand, the cultural associations of this sizable body of recent converts seem to have found an incorporation in the extended mosque’s spatial articulations, the profuse introduction of mosaics on the mihrab wall as well as in the cupolas, on the other hand, potentially delineates a historical and a cultural reappropriation on al-Ḥakam II’s part of the Syrian Umayyad visual legacy (Dodds 1992, 20–21). Rather than an infusion of overarching Islamic ethos then, an explicit blend of Syrian Umayyad appropriations and indigenous aspirations is renewed in these visual formations. Finally, the ambitious expansion of the mosque of Cordoba in 987 under the powerful regent (ḥājib), al-Manṣūr, too, prompts an engagement with its visual meaning on comparable grounds of political expediency. As Mariam Rosser-Owen writes: ‘constructing at the royal monument par excellence—that is, Umayyads’ dynastic mosque in Cordoba—al-Mansūr made clear public statements about the power of his position’ (2007, 85). It is in the heart of the Muslim, and nowhere else. Through such an imagining, ‘Masjid-e Qurt̤uba,’ in its resolute quest for an Islamic Renaissance, proffers a differing, ideologically charged insight through which the multivalent connotations of the Cordoba mosque can be appropriated. In doing so, it charts a trajectory disparate from the one that brings the composite Andalusian formations into a reckoning in the historical as well as visual life of the Cordoba mosque. Aḥmad, ʿAzīz. 1968. Iqbāl: Naʾī Tashkīl. Lahore: Globe Publishers. Bloom, Jonathan. 1989. Minaret: Symbol of Islam. Oxford Studies in Islamic Art, vol. 7. Oxford: Oxford University Press. Creswell, K.A.C. 1969. Early Muslim Architecture. 2 vols. 2nd ed. New York: Hacker Art Books, 1979. Dodds, Jerrilynn, ed. 1992. Al-Andalus: The Art of Islamic Spain. New York: Metropolitan Museum of Art. Flood, Finbarr Barry. 2001. The Great Mosque of Damascus: Studies on the Mak- ings of an Umayyad Visual Culture. Leiden: E.J. Brill. Grabar, Oleg. 1973. The Formation of Islamic Art. New Haven; London: Yale University Press. Hanafī, ‘Amīq. 1977. ‘Iqbāl kī Masjid-e Qurt̤uba.’ In Fikr-e Iqbāl. Edited by ʿĀlam Khūndmīrī and Mughnī Tabassum. Hyderabad: Kul Hind Iqbāl Ṣadī Taqārīb Committee. Iqbāl, Muḥammad. 1989. Kulliyāt-e Iqbāl Urdu. Aligarh: Educational Book House. Khoury, Nuha. 1996. ‘The Meaning of the Great Mosque of Cordoba in the Tenth Century.’ Muqarnas 13:80–98. Noorani, Yaseen. 1999. ‘The Lost Garden of Al-Andalus: Islamic Spain and the Poetic Inversion of Colonialism.’ International Journal of Middle East Studies 31(2):237–54. Rosser-Owen, Mariam. 2007. ‘Poems in Stone: The Iconography of ‘Āmirid Poetry, and Its ‘Petrification’ on ‘Āmirid Marbles.’ In Revisiting Al-Andalus: Perspectives on the Material Culture of Islamic Iberia and Beyond. Edited by Glaire Anderson and Mariam Rosser-Owen. Leiden; Boston: E.J. Brill. 1. Unless otherwise noted, all translations from the Urdu are mine. 2. The scholarly literature on the mosque of Cordoba is vast. Representative works in English within an art-historical context include Creswell (1969), Grabar (1973), Dodds (1992) and Khoury (1996). 3. This and the following photographs were taken by the author. 4. An excellent study of the Great Mosque of Damascus is Flood (2001). 5. Also see Bloom (1989). Essay and Images © Riyaz Latif. Originally from Ahmedabad, Gujarat, Riyaz Latif is currently a professor at FLAME University in Pune. He emerged as a significant voice in Urdu poetry during the last decade of the twentieth century, and his poems have been published in reputed Urdu literary journals of India & Pakistan. Along with two collections of Urdu poetry, Hindasa Be-Khwaab Raton Ka(2006) and Adam Taraash (2016), as well as a book of translations into Urdu from European poetry, titled Mera Khoya Awazah (2014), he has published a number of articles, and has translated Urdu fiction and poetry into English.